"Tor Control (Anonymity Layer)" configures your browser to start and use the anonymous Tor network. The extension starts a Tor instance in a background and when Tor is fully connected, your browser is configured to direct its traffic over the Tor network. Also as soon as the Tor network handshaking is complete, WebRTC access to your local IP is blocked to prevent IP leakage. 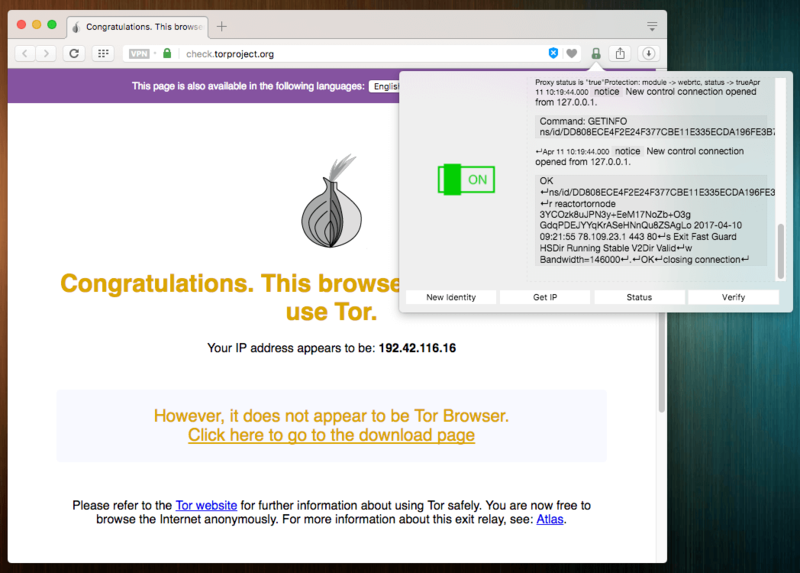 This extension aims to bring Tor Browser like anonymity to browser of your choice. Note that you need to follow the setup steps before the extension is functional. Read FAQ 1 for more info. What is "Tor Control" extension and how does it work? Download “Tor Bundle” and extract it in a local directory. How can I make sure I am connected to the Tor network? When the connection button on the panel is pressed, the extension starts a Tor instance and it connects you to the Tor network. You can review the current connection state in the log section. When extension notifies you of a successful connection, go to the panel and click on the verify button to open https://check.torproject.org/ in a browser tab. This will confirm your connection. Is it possible to change my external IP when I am connected to the Tor network? Yes, open the panel and press "New Identity" button once. This will ask Tor to request a new exit node and hence a new external IP address. Tor is free software for enabling anonymous communication to protect user privacy. Read https://en.wikipedia.org/wiki/Tor_(anonymity_network) for more information or check the official Tor website. How can I make sure my browser is no leaking my private IP address? Open this page in a browser tab to start a new test. You can also see all the public IP addresses your browser is revealing here. How can I install the native client?